For several years a growing number of felines have developed cancerous tumors at the location site of vaccines. Vaccines such as distemper, rabies and feline leukemia have caused these tumors in what statistics are showing to be anywhere from 1 in 1,000 to 1 in 10,000 vaccine injections. The success rate for treatment of these tumors is unfortunately extremely low. Please read the information links about vaccines to help you make an educated decision on if you should vaccinate your cat or dog. I personally do not vaccinate my felines for fear of cancer and destroying their natural immune system. I have had too many cat owners come to me with felines that have gotten cancer from vaccines. If your felines are indoors then I would seriously think about this. If you have to get shots for your cat then PLEASE get a holistic vet to help your cat´s immune system with a remedy that helps support the immune system after those shots have been given. If you do not have a holistic vet, Click Here to email our Veterinarian Dr Gardner for help. Her fees are very reasonable at 50.00 an hour for a phone consult and she can mail you the remedies your felines need. Dr Gardner can reply to follow ups with email. Although the Rabies vaccine is required by law you can decide not to have them administered to your pets .I asked my allopathic vet what he would do to me if I decided never to give my felines shots again, “arrest me”? His reply was, “No”. However, if any of my felines needed to stay over night in his clinic they would have to have the Rabies shot. I decided to cross that bridge when/if they had to stay over in a clinic and stopped shots on our felines in 1995. All our felines have been healthier because of our decision to stop the shots since they are indoor felines. 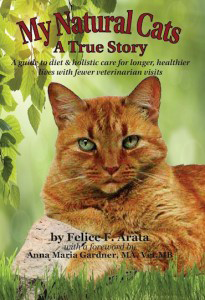 All our fur babies, past and present, have been strong and healthy from the raw diet and no shots. However, our felines are indoor felines except for walking King Tut in the spring and fall in our back yard. We also keep the sunroom windows open for fresh spring and fall air.